The Cabo Verde Islands are located in the central eastern Atlantic (14°50’–17°20’N, 22°40’–25°30’W), ca. 750 km west of Senegal. There are 10 islands (of which nine are inhabited) and eight islets, totalling a land area of 4,033 sq km. The archipelago was formed by rock accumulation, resulting from eruptions from a hotspot under submarine platforms. The coastline is 965 km long and the shelf (depth <200 m) is 5,934 sq km. The largest island, both in size and population, is Santiago, where the capital of Praia is located. 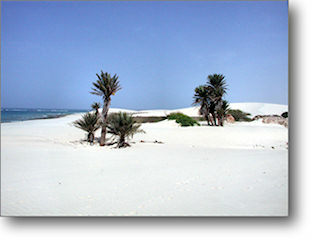 The climate is arid tropical, with two seasons: a moderate season (December–June, with an average seawater temperature of 22°–23°C) and a warm season (26°–27°C). 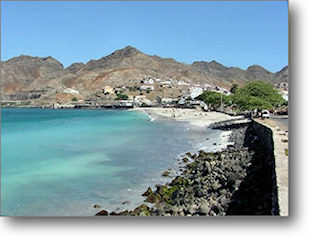 Precipitation is meagre and erratic – indeed Cape Verde can be seen as an island extension of the arid Sahel zone. The three easternmost islands (Sal, Boavista, Maio) are relatively flat, highly eroded and have a very arid climate due to their exposure to dry and hot winds coming from the Sahara. 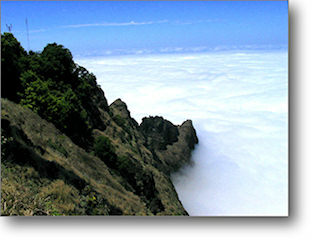 In contrast, the more western and geologically younger islands (Santiago, Fogo, Brava, São Nicolau, Santo Antão) have a rugged landscape of high peaks, ridges, plateaux and deep valleys. Coastlines of the islands are often cliff-lined or bound by steep slopes that descend to rocky shores or to beaches of black or white sand. The four largest islands (Santiago, Santo Antão, Boavista, Fogo) comprise ca. 71% of the total territory, against 28 % for the remaining islands (São Vicente, São Nicolau, Sal, Maio, Brava). The uninhabited island of Santa Luzia and the islets of Raso and Branco (which now have the status of nature reserve protected by law) represent an area of 47 sq km. Santiago (991 sq km) is the largest island of Cabo Verde, its most important agricultural centre and home to half the nation’s population. It was the first of the islands to be inhabited and it is also home to the nation's capital city of Praia. The island is mountainous, although slightly flatter in the southeast. The wetter climate of the interior and the eastern coast contrasts with the dryer one in the south and southwest. The second largest island is Santo Antão (779 sq km), which is both the most western and most northern islands in the archipelago of Cabo Verde. The island is entirely made up of volcanic material (basalts) and is one of the most mountainous of Cabo Verde. The highest mountain is Topo de Coroa, reaching a height of 1,979 m, the second highest is Pico da Cruz with 1,585 m.